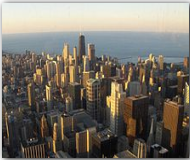 Illinois covers 57,918 square miles and has a population of 12,419,293 people. Illinois’s capital is Springfield, which has a population of 111,454. Other important cities are Chicago (pop. 2,896,016), Arlington Heights (pop. 76,031), Bloomington(pop. 64,808), Champaign (pop. 67,518), Cicero (pop. 85,616), Decatur (pop. 81,860), Elgin (pop. 94,487), Evanston (pop. 74,239), Joliet (pop. 106,221),Naperville (pop. 128,358), Palatine (pop. 65,479), Rockford (pop. 150,115),Schaumburg (pop. 75,386) and Skokie (pop. 63,348). Illinois was admitted to the Union on July 3rd, 1890 as the 43rd state. It’s bordered by Wisconsin to the north, Iowa to the northwest, Missouri to the west and southwest, Indiana to the east and Kentucky to the southeast. The state flower is the “Purple Violet” and it’s nickname is “Prairie State”. Illinois’s economy is broken into two categories; agriculture and industry. CCorn, soybeans, hogs, cattle, dairy products and wheat provide for the agricultural side. While machinery, food processing, electric equipment, chemical products, printing and publishing, fabricated metal products, transportation equipment, petroleum and coal provide for the industrial side.